The Islington North MP, Jeremy Corbyn, has been elected Labour party leader. The 66-year-old winner of one of the key races in recent times has been announced in London. "Can I start by thanking everyone who took part in this democratic election," Corbyn said in a victory speech, calling the election a “huge democratic exercise” for millions of people. Corbyn, an admirer of Karl Marx, won 59.5 percent of the ballots cast, or 251,417 votes, in the leadership election, winning in the first round. Corbyn pledged that the Labour party would become “more inclusive, more involved, and more democratic. It will shape the future for everyone,” he said. “Poverty does not have to be inevitable. Things can, and they will, change,” he vowed. "The Tories have used the economic crisis of 2008 to impose a terrible burden on the poorest people in this country," Corbyn told an audience of Labour members and supporters at a conference in London called to announce the leadership results Saturday. Given that David Cameron has hinted that he will not run for a third term as prime minister, Corbyn's rise has put the long race to succeed him as the next potential challenge. "I am fed up with the social cleansing of London by this Tory government," he said of Cameron's Conservatives. Imagine being Tony Blair, having devoted yourself so publicly & completely to telling your party to defeat Corbyn, then getting this result. “The speech Jeremy Corbyn made was wonderful,” Neil Clark, a British journalist and writer, told RT. “It's a wonderful day for British democracy... Don't forget, over 400,000 people voted, it's the biggest party leadership election campaign in our history,” he added. “What this campaign showed is a massive disconnect between the establishment elite who told us Corbyn couldn't win. First they tried to make fun of him, they’ve done it all the way through, they attacked him, it was a terrible smear campaign that went for the last two or three months, trying to link him to extremist people, and it all backfired because he won nearly 60 percent of the vote. I think it tells how out of touch these media gatekeepers are. The British media was overwhelmingly hostile to him. You can count on one hand the number of journalists who actually supported him in the British media,” Clark said. Many fear that Corbyn's victory could potentially divide the party, however. “Are they going to be good sports and accept the results or are they going to try to overthrow Jeremy Corbyn, try to topple him – well, let's hope that they do accept the result,” he said. During his election campaign, Corbyn gained supporters from several of the UK’s largest trade unions and received the highest number of supporting nominations from Constituency Labour Parties (CLPs). Britain’s biggest union, Unite, with 1.4 million members, backed Corbyn in early July, citing his anti-war and anti-austerity policies as the main reasons for throwing their weight behind the candidate. Corbyn called for a new “national maximum wage” of £10 an hour to end what he described as a “gross inequality” in Britain, speaking to the Financial Times last month. Almost 1 in 100 people in the UK voted in the #LabourLeadership election. This growth in membership is something to be proud of. Corbyn has also pledged to renationalise Britain's railways and bring energy companies into public ownership if he became prime minister. He is in fact the public’s favorite Labour candidate to be the next Prime Minister, second only among all candidates, to Boris Johnson. At his final rally, Corbyn told supporters he was determined to win back those who do not vote at general elections. “Fundamentally many people are turned off by a political process when the major parties are not saying anything different enough about how we run the economy, and totally turned off by a style of politics which seems to rely on the levels of clubhouse theatrical abuse that you can throw across at each other in parliament and across the airwaves,” the Guardian reported on Friday. Corbyn, who is a member of the Palestinian Solidarity Campaign, Amnesty International, the Campaign for Nuclear Disarmament and a founder of the Stop the War Coalition against “unjust wars,” has had a number of opponents, with a “Stop Corbyn” campaign accusing the politician of anti-Semitism, among other things. 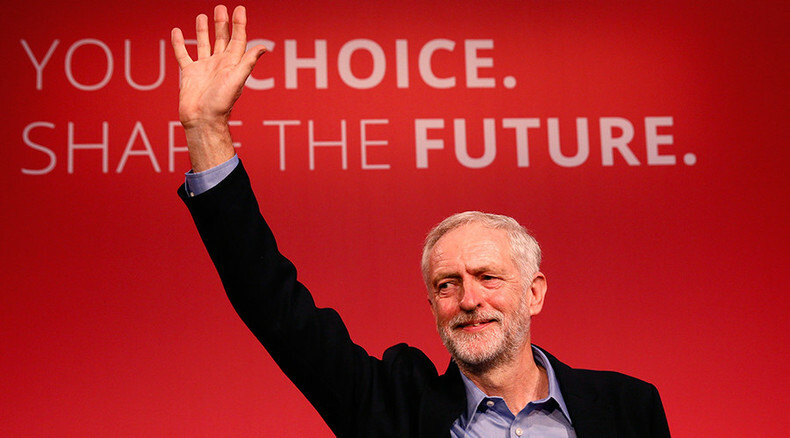 READ MORE: #LabourLeadership: Can Corbyn prove the bookies right? Prominent Labour MPs and former ministers have publicly warned voters against choosing the bearded left-winger, including former Prime Ministers Tony Blair and Gordon Brown, former Foreign Secretary David Miliband, former Labour leader Neil Kinnock and Jon Cruddas MP. Corbyn faces mass resignations with at least a dozen shadow cabinet ministers refusing to serve under him.